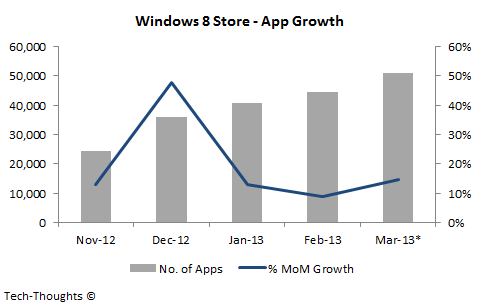 According to data from MetroStore Scanner, the growth of Windows 8 apps has noticeably slowed in Q1 2013. According to the data, the Windows Store is expected to top 50,000 apps by the end of March, but MoM growth has slowed to just 10-15%. In response, Microsoft has launched a promotion, offering developers $100 to publish an app on the Windows Store. Let's take a look at the reasons for this surprisingly early decline in growth. $100 is unlikely to attract large developers, so I would have to assume that this promotion is meant for small, independent developers. But the timing of this promotion, combined with the chart above, tells me that Microsoft is feeling some pressure. Microsoft has apparently used this approach for Windows Phone as well. Unfortunately, getting employees to build apps in the spare time was never likely to be a long-term solution. At a certain point, those employees would run out of time, motivation or simply ideas to continue building apps. As this artificial boost is lost, it becomes more difficult to add apps to a fledgling platform. I had touched upon this earlier, in my post on the PC replacement cycle - The average Windows PC buyer is not as sophisticated as an average Mac buyer, and therefore, the usage of the average Windows PC would never involve downloading apps. This has already proved true for the Mac App Store, and app engagement on Windows 8 PCs is likely to be even lower. Low consumer interest in Windows 8/RT based tablets has done nothing to rectify this situation. Microsoft's promotion is primarily aimed at low-end publishers. Their prime concern at the moment isn't app quality, but quantity. Unless the app growth on the Windows Store remains strong, Microsoft has very little chance of attracting many major developers to the platform. Of course, strong tablet sales would help, but that seems like a pipedream at this point.